Peliosis Hepatis (PH) is a rare liver vascular abnormality notable for large dilated sinusoids within the liver parenchyma. Its mechanism is unclear but is associated with some infections and malignancies including Hodgkin’s disease and lymphoplasmacytic lymphoma. Here we describe a case of a 63 years male presenting to the Emergency Department with one month of abdominal pain and diarrhea in the setting of a 60lb unintentional weight loss. Follow-up imaging and liver biopsy revealed the presence of a metastatic a well-differentiated neuroendocrine tumor metastatic to the liver and PH. From our review of the literature, this is the first case of a neuroendocrine tumor associated with PH, which warrants further study and investigation. Peliosis Hepatis is a rare vascular malformation in the liver that is composed of blood filled sinusoids. Its etiology is unclear but has been associated with a variety of medications, bacterial infections, malignancies, pregnancy and solid organ transplantation. Most patients are asymptomatic at the time of diagnosis. Here we present a patient with one month of diarrhea who on initial imaging was found to have multiple hemangiomas. Follow-up liver biopsy, however, demonstrated peliosis hepatis and a metastatic neuroendocrine tumor. A 63 year-old male with hypertension, dyslipidemia, gout and a history of alcohol abuse presented to the emergency department with complaints of diarrhea for one month associated with diffuse intermittent, generalized abdominal pain. He also reported a 60lb unintentional weight loss over the preceding 1 year. Initial laboratory findings identified mild acute kidney injury that responded to intravenous hydration. Stool studies for infectious etiologies including Clostridium difficile were negative. Abdominal computed tomography without contrast done in the Emergency Department demonstrated diffuse hypodense liver lesions and rectal wall thickening. An inpatient colonoscopy revealed one diminutive tubular adenoma in the transverse colon but was otherwise unremarkable. Random colon biopsies were notable only for non-specific acute cryptitis. His diarrheal symptoms spontaneously resolved during the hospitalization and the patient was discharged with outpatient follow-up. 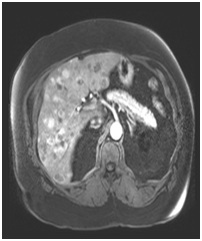 As an outpatient, an MRI of the abdomen with and without contrast was obtained to further evaluate the liver abnormalities noted on CT and demonstrated (Figure 1) an enlarged liver with innumerable T1 hypointense and T2 hyperintense foci throughout the liver parenchyma, the largest 5.4 x 3.6cm across, with early, predominantly peripheral and somewhat nodular enhancement following contrast administration with “filling-in” on the delayed phase imaging without restricted diffusion, consistent with multiple hepatic hemangiomas. A PET/CT was also obtained (Figure 2) revealing hypermetabolic foci throughout the liver with maximum foci of hypermetabolism in the distal ileum and mesenteric root. Serological studies for B. henselae IgG were negative. A liver biopsy was performed with a 18 gauge, 22mm needle (Figures 3, 4, 5 and 6). H&E sections demonstrated tumor with organoid architecture, small to medium cells with eosinophilic to amphophilic, finely granular cytoplasm and uniform nuclei. No necrosis or mitosis is apparent. 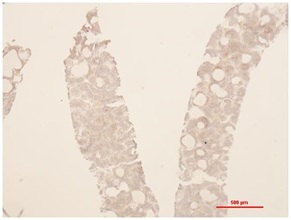 The immunohistochemical stains with appropriate controls show that the tumor cells are positive for AE1/AE3, CD56, synaptophysin, chromogranin and negative for CK7, CK20, TTF1 and napsin-A. The proliferation index (Ki-67) is approximately < 3%. The morphology and immunoprofile was consistent with neuroendocrine tumor. In addition, background liver parenchymal shows extensive sinusoidal dilatation with a central blood-filled multiple microcystic vascular cavities that appear focally lined by sinusoidal endothelium, or totally lack a clear cell lining, consistent with peliosis hepatis. Peliosis Hepatis (PH), is a rare hepatic vascular abnormality characterized by dilated sinusoids with blood-filled cystic spaces within the liver parenchyma . PH traditionally has been associated with infections including Bartonella henselae (bacillary angiomatosis), but has also been identified in lymphoplasmacytic lymphoma, Castleman’s Disease, Waldenstrom’s Hyperglobulinemia, Hodgkin’s disease, pregnancy, renal and cardiac transplantation, as well as associated with medication exposure such as 6-thioguanine, corticosteroids, androgens, oral contraceptives and danazol [1,2]. Most patients are asymptomatic on presentation or in rare cases present with intraperitoneal hemorrhage after rupture of blood filled cysts . In this case, the patient first presented with diarrhea and weight loss. The initial differential diagnosis for this patient’s diarrhea included infections, inflammatory causes such as inflammatory bowel disease and gastrointestinal pre-neoplastic or neoplastic lesions such as a large tubular adenoma. A colonoscopy was performed with random colonic biopsies, which was unremarkable. 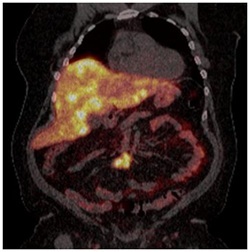 CT imaging, however, did demonstrate numerous hypodense liver lesions. A subsequent PET/CT scan provided further insight into the etiology of the liver lesions with the finding of numerous hypermetabolic foci throughout the liver and distal ileum concerning for neuroendocrine tumor. A biopsy of the liver to confirm the presence of neuroendocrine tumor in the liver also identified the presence of PH. From our review of the literature, this is the first report of a neuroendocrine tumor associated with PH. The prognostic significance of the finding of PH is unclear. Moreover, there is no specific treatment for PH or guidelines for monitoring, however, rare cases of partial hepatectomy, liver transplantation, and hepatic artery embolization have been reported in the literature . On histopathology, PH is characterized by the presence of vascular spaces lined by either hepatocytes or endothelial cells. To distinguish PH from sinusoidal dilation, rupture of the reticulin fibers that support hepatocytes and sinusoids is observed . Based on this finding it is postulated that sinusoidal wall damage or destruction of the reticulin fibers caused by obstruction of sinusoidal blood flow is involved in the pathogenesis of PH . The presence of a neuroendocrine tumor in this case is unique and raises the possibility of another called “pseudo-hemorrhage,” a process previously observed with pancreatic neuroendocrine tumors by which blood vessels dilate, followed by endothelial cell detachment, resulting in lakes or caverns of blood within the parenchyma. In this presentation of PH a similar mechanism might be present . Further study, however, is warranted is to better understand the pathophysiology of PH and its clinical significance. Iannaccone R, Federle MP, Brancatelli G, Matsui O, Fishman EK, et al. (2006) Peliosis hepatis: Spectrum of imaging findings. AJR Am J Roentgenol 187: 43-53. Copra M, Bacchi M, Bacchi C, Coelho KI (2004) Peliosis Hepatis Associated with Lymphoplasmacytic Lymphoma: An Autopsy Case Report. Arch Pathol Lab Med 128: 1283-1285. Downes R, Cambridge C, Diggiss C, Iferenta J, Sharmae M (2015) A case of intra-abdominal hemorrhage secondary to Peliosis hepatis. Int J Surg Case Rep 7:47-50. Suzuki S, Suzuki H, Mochida Y, Hirai H, Yoshida T, et al. (2011) Liver Hemorrhage Due to Idiopathic Peliosis Hepatis Successfully Treated with Hepatic Artery Embolization. Int Surg 96: 310-315. Wang Z, Peng L, Song YL, et al. (2018) Pseudo-hemorrhagic region formation in pancreatic neuroendocrine tumors is a result of blood vessel dilation followed by endothelial cell detachment. Oncol Lett 15: 4225-4261. Figure 1: MRI Abdomen, early arterial phase. Figure 2: PET/CT with gallium. Figure 3: H&E staining at a) low magnification and b) high magnification of a low grade neuroendocrine tumor with background of peliosis hepatis. 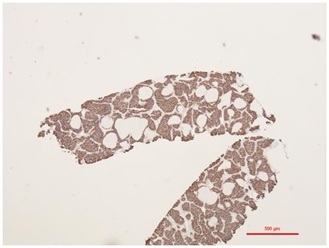 Figure 4: AE1/AE3 staining of neuroendocrine tumor cells. 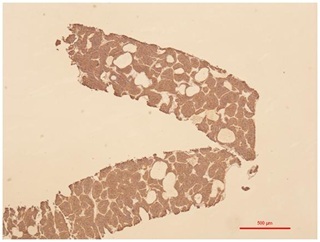 Figure 5: CD-56 staining of neuroendocrine tumor cells. Figure 6: Chromogranin staining of neuroendocrine cells. Citation: Gabre J, Adjapong O, Kaplan DE (2019) A Rare Presentation of Peliosis Hepatis in a Patient with a Metastatic Neuroendocrine Tumor. J Clin Stud Med Case Rep 6: 061. Copyright: © 2019 Gabre J, et al. This is an open-access article distributed under the terms of the Creative Commons Attribution License, which permits unrestricted use, distribution, and reproduction in any medium, provided the original author and source are credited.